Dell 800GB SSD SAS 2.5"
As NEW have only written 14 TB can write maximal 14257000 TB !!! Compatible with all 2.5" SAS, SATA HDD and SSD drives. 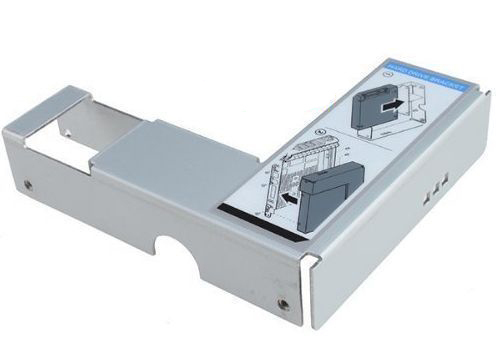 The SSD/HDD connector goes DIRECT into the HDD-backplane connector BEST SOLUTION ! Note: To support SAS drives, a SAS controller is required. To convert a 2.5" SATA SSD to 3.5"
Compatible with: Dell EMC PowerEdge R440, R540, R740, R740XD, C6400, R6400, R6415, C6420, R7415, R7425, etc. PowerEdges : 840, 1900, 1950, 2900, 2950, 2970, 6900, 6950, R300, T300, R900, R905, etc. PowerVaults : MD1000, MD3000, MD3000i, NF100, NF500, NF600, etc. PowerEdges : R230, R310, T310, R320, T320, R330, T330, R410, T410, R420, T420, R430, T430, T440, R415, R510, R515, R520, R530, R610, T610, R620, T620, R630, T630, T640, R710, T710, R720, R720XD, R730, R730XD, VRTX, etc. PowerVaults : MD1200, MD1400, MD3200m MD3200i, MD3220, MD3260, MD3060, MD3400, MD3600i, MD3660, DR4000, DL4300, NX3000, NX3100, etc. x HP Harddisk Tray / Caddy , Non Hot-Plug 3.5"
ML110G7, ML150G5, DL320G4, DL360G5, DL360G7, DL380G6, DL380G7, etc. DL80, DL160, DL320e, DL360e, DL360p, DL380e, DL380p, DL385p, DL560, ML310e, Apollo 2200 r2200, etc. Brackets 2.5" No Brackets 2.5"
Brackets 3.5" No Brackets 3.5"